Receive the statewide California Writers Club literary magazine, The CWC Literary Review. Publish in statewide publications, the bi-annual The Bulletin , annual Literary Review, and the periodic West Winds. Be considered for the bi-annual Jack London Award, for service to the branch, or the Ina Coolbrith Award, for sustained service to the statewide organization. *Non-members are welcome to audit one session. * New members, please read all information on this page before filling out application. ** Renewing Members, you can get an automatic renewal to avoid having to pay re-instatement fees if you miss the renewal window. For DUAL MEMBERS, this amount is $25. Lapsed Members, same as New members. The membership year is from July 1 to June 30. Active, Associate, and Supporting members pay an initiation fee of $20, plus annual dues of $45. After January 1st, a half-year membership is available for half-price. Those who apply between January 1st and April 30th pay $22.50 in dues for the balance of the Club year, plus the $20 initiation fee. Youth members pay a reduced annual dues of $20 with no initiation fee. After January 1, a half-year membership is available for half-price. To apply for membership, you must submit a completed application and payment. Pay your dues via Paypal through the links below. Both: If you don’t wish to use Paypal, you must still fill out the online membership form and mail or hand our treasurer a check. 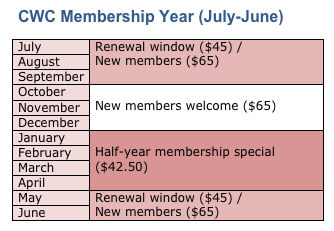 NOTE: The membership renewal window is May-September. After September 30, members who have not renewed msut join as new members at the new member fee of $65, or in January at the half-year price of $42.50. New members may join at any time. There is a half-year-discount for members joining after January 1st. The primary levels of membership in the California Writers Club are Active and Associate. Active membership is open to all published writers, editors and photojournalists who meet the qualifications stated below. The Club also welcomes aspiring writers as Associate members. Those who wish to participate in the Club but do not meet membership requirements can become Supporting or Youth members. Active members are writers who can vote and hold office in the club. Active applicants must submit list of publications (not to exceed one page), plus clips. Requirements are listed below. Fiction or Nonfiction: Applicants must have been published or show proof of acceptance within the past three years of no fewer than three stories or articles in one or more periodicals of general circulation, or in one or more books published within the past ten years by a publisher of standing. Poetry: A writer must have been published three times within the past two years in one or more periodicals that exercise editorial discrimination, or must have had a book of sufficient distinction published within the past five years. Publication: At least one play within the past five years published in book form or by a publisher of standing. Staged Performance: One performance by a professional cast or recognized semiprofessional group within the past three years. Screenplays: One professional production within the past five years. Radio: Five scripts produced professionally within the past five years. Television: Two half-hour scripts (or their equivalent in time) produced professionally within the past five years. Photojournalism: A photojournalist must show publication within the past three years of no fewer than three pieces in one or more periodicals of general circulation, or must have had a book published within the past five years. Editors: The applicant must be an editor of a periodical of general circulation. Newspaper Writers: The applicant must be or have been a feature writer, columnist, or regular bylined reporter. Self-Publishers: Material is required to be published under the applicant’s own imprint. Eligibility is based on professional presentation, writing style, graphics, and planned distribution. Persons who work in literary fields, i.e. editors, photojournalists, agents, etc. Associate applicants can submit up to five pages of current manuscript or project. This category includes adults as social members and students from 16 to 22 years old as Youth members. Supporting members join the local branch only (not statewide). They receive most club benefits but cannot vote or hold office. No writing sample is required. Supporting and Associate members may apply for a change in membership status when they achieve the criteria of another category. Active members who are no longer writing can stay in the club with voting rights as a member emeritus or emerita. Patron members are people who have made a substantial gift or contribution to the club (they can not vote or hold office unless they are also an active or associate member.). Honorary members are writers of eminence who bring honor to the club. They shall not pay dues, hold office, or vote. Speakers and workshop chairs may become Courtesy members for one year, and have no voting or officer rights. Dual membership is for members of two clubs. Life memberships are available for a one-time fee. Motivate yourself. Use your regular attendance at support/critique groups as a commitment to a personal deadline. Elevate your credibility with publishers and agents. Add California Writers Club to your resume and list of working credits. The support and friendship of other writers makes your writing practices and presence a habit. Meaningful volunteer work helping writers of all ages.